Today, we have just release Groovy-Eclipse 2.1.2 and AJDT 2.1.2. By coincidence, they both have the same version number. We've made lots of improvements to Groovy-Eclipse including inline renaming support, mark/find occurrences as you type, and type inferencing improvements. You can find all the details at the New and Noteworthy page. As always, please raise bug reports and enhancement requests at our Codehaus issue tracker. We expect to release Groovy 1.8 support shortly. Our enhancements for AJDT have mostly centered around supporting Intertype Inner Types. a new AspectJ language feature. You can read about it at the AJDT New and Noteworthy. Please raise bugs and feature requests at Eclipse's bugzilla. I like Git in theory. Distributed version control has many advantages over non-distributed including local branching, easier task switching, and easier offline work. However, as an Eclipse user, I find it highly disruptive to drop down to the command line whenever I need to perform any git commands. Despite its advantages, using git instead of CVS or SVN has felt like a big step backward because of its lack of Eclipse tooling. Until now, I have only been using git occasionally, and so I could live with the inconvenience. However, it looks like some of my major projects will be moving to git and so I need to figure out what to do. I have been eagerly awaiting the eGit tooling to reach a reasonable level of maturity. I decided to try it out and see how far along it is. I installed eGit 0.11.3 from the public repository (http://download.eclipse.org/egit/updates) into my SpringSource Tool Suite. And as expected, the Git Repository perspective was initially empty. So far so good. 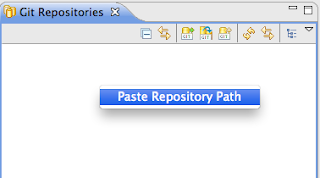 Instead, I used the "clone repositories" command button. I was able to do what I wanted to, but it was slightly less intuitive than I would have hoped. After cloning, Git placed the entire repository on my hard drive, which is nice because checking out, exploring, and comparing is much faster than using a traditional VCS. Performing these operations within Eclipse is just as speedy as doing things like comparing local history. At this point, I was very impressed. Then I started playing around... I right-clicked on the file I had just changed and selected Assume unchanged. Uh-oh! ClassCastException. Now, click Assume changed. IOException. Apparently, though something worked and I was able to continue with the commit and then view the commit in history. Despite its problems, eGit has a good UI. The project is clearly following the Eclipse User Interface Guidelines, and I was able to easily transfer my familiarity with Eclipse's CVS and SVN tools to working with git. This is a strong indicator to me that the project is headed in the right direction even if it is not quite there yet. The basic features that I need exist, but after 20 minutes of using, I hit several obstacles. None of them were insurmountable and the project is usable. Despite this, I do expect that future releases will be significantly more solid. I will likely be using eGit for my day to day work, but for now this will be largely for repository and history exploration, rather than for commit and branch management, which I'll probably use the command line for. EDIT: I raised Bug 339158 and Bug 339159 to track some of the problems I found.